But, here I was a few months later, eagerly anticipating my tall-boy sized mint tea. I was unexpectedly awakened from my morning stupor by a surprising event. 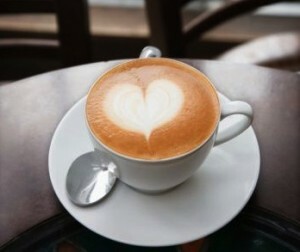 Maria, the morning barista from behind the counter was suddenly in front of me and stared at me intently. She gently latched onto my wrist, peered into my eyes, and said, “I have been watching you. I think I know why you are wearing that scarf. I want you to know that I know you will be okay and I am thinking about you.” Then she enveloped me in a soft hug, squeezed me tight and returned to making non-fat double cappuccinos for the hordes of Nike employees desperate for their daily fix. All this occurred while the crowd waiting for their orders stood and watched. 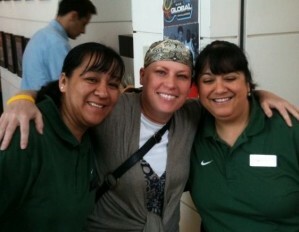 Me and the coffee ladies. Maria is on the left. And, really, I could have cared less about causing this disruption. Maria’s embrace had filled me with pure warmth and a powerful sense that things really would be “okay.” Easing back to my desk, I was buoyed by both the hot tea and my expanding bubble of optimism. What was so odd but wonderful is that while I had registered Maria’s presence countless times, I hadn’t ever really given her more than a quick “good morning” or “thank you.” I didn’t even know her name before this, even though I was ritually presented with her nametag. And now this kind woman had gone out of her way to not only acknowledge me, but to stop in her tracks and give me her support and a big boost of positive energy. I have been so blessed during this journey to have an incredible circle of support that grows wider every day. I am honored and amazed at how generous friends and family have been with their words and actions. 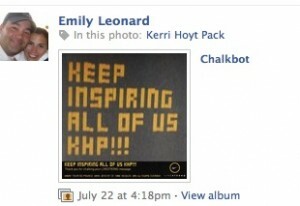 People log on to livestrong.org/chalkbot. 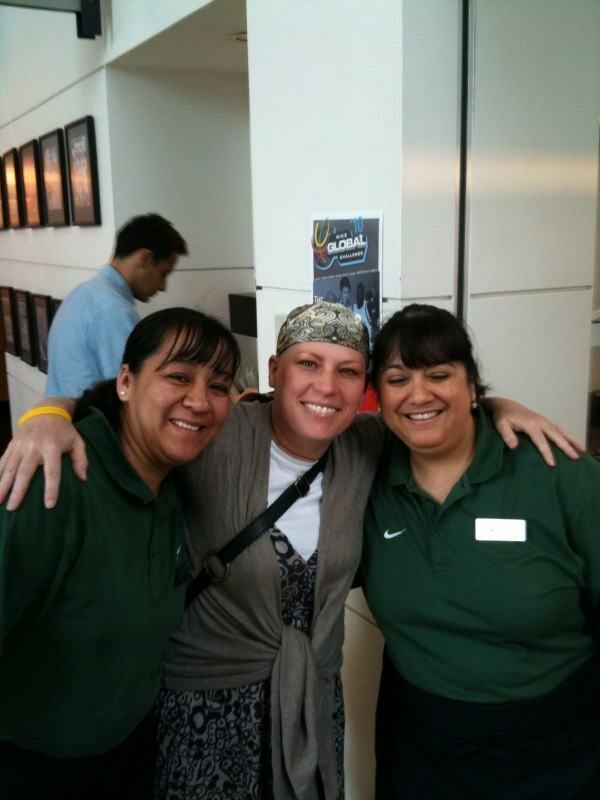 They type in their messages of inspiration for people battling cancer. If their message gets picked, it’s transmitted to a special truck in France that prints it in chalk on the roads of the Tour de France course. Then a picture of the message and the GPS coordinates of the location in France are sent back to the originator of the message. Here are two Chalkbot messages that my good pals Emily and Lawrence had printed on the streets of France especially for me. Living stronger friends! But the best thing about having my own social media cheer squad is that it’s exponential. As more friends-of-friends-of-friends find me and communicate with me, more branches of connections are formed. My roots go deeper and I get stronger. Despite being a somewhat cynical marketer, I had approached emerging media channels with the inherent interest and curiosity that goes with my job. I had waded pretty deep into this new world order. But now I know that I missed a lot. The big “aha” for me is that there is a real and beating heart to it all. We live in a fragmented world where community is no longer defined by the corner store, the church down the road, the neighborhood barbershop and the public school. It is tools like Facebook that now allow people to come out from behind their own coffee counters like Maria did even for an instant and really see people. My extended family includes Bubby and Big Mike, parents of my close friend Danny. Love the emoticons! I used to argue that technology is making us more isolated and anemic in human connections. And I worried about it deeply as a wary mother of emerging tween girls. But I have a new set of lenses on now. Believe me when I say that a flurry of Facebook thumbs up “likes” or a even a silly emoticon can be just as warm and uplifting as that hug I got from Maria. Virtual yes, but oh-so-real. Just to let you know how happy we are that you are doing so well. I know that Grandma was so relieved at your progress and what a gift that she knew that. How precious that day at Erika’s was with all of you together with her. Love you, Kath and Roy. hey aunt kerri.. ive been reading and am seriously impressed with your quality of writing! its really inspiring to read about how strong you can be, no matter what comes your way. just wanted to give you an extra reminder that were all thinking about you! love you so much. I am going to give Maria a hug next time whe I am in Campus for sure! Hi cuz, It doesn’t surprise me one bit that Maria would give you a hug, let’s face it you are one of the good people…..anyone who would let thier cousin tag along to the holiest of grounds ( high school girl cheerleading camp) has earned a lot of random hugs in my book. Like Maria I have always thought you would be ok. I bet Maria is going to get a bunch of unexpected hugs for this. What a wonderful person. Same goes for all of the others you highlighted today. It feels good knowing you are surrounded by oceans of love. I hadn’t thought to repost your blog but love that idea. Off to repost but first I will sign off with a big fat virtual hug. You just inspired my day. 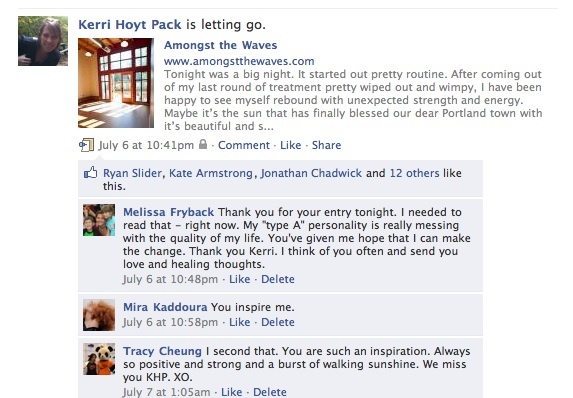 “Everything is, and always will be, okay.” Continuing to send healing meditations, prayers, and big hugs for you, Kerri.